I have been a long time user of the Backup/Restore commands in the Organizer of Photoshop Elements. My general practice has been to use the Full Backup option. However, as my photo/video collection has grown (about 600 Gb and 46K items) over the years, the time to do the backup and storage space it requires have grown tremendously. More recently, I have begun to use the Incremental Backup option more and more. The Incremental Backup builds on the last Full Backup done and only adds those files and Catalog changes since it was done. Obviously, the storage space is significantly reduced, and initially I thought the time to do an incremental backup would also be significantly reduced. That is definitely not the case. Generally speaking, on my PC, an incremental backup takes just about as long to do as does a full backup. Here is an example for my most recent incremental backup. The first two three steps take only two or three minutes. After calculating the media size, there is message with no progress bar that says that PSE is loading the previous backup. This message stayed on the screen for about an hour and half with no other indication that PSE is even running. In fact, if you bring up the Task Manager, it shows that the PSE Organizer is not responding. At this point it is very tempting to abort the process, thinking PSE has basically crashed. Don’t. It is still hard at work. 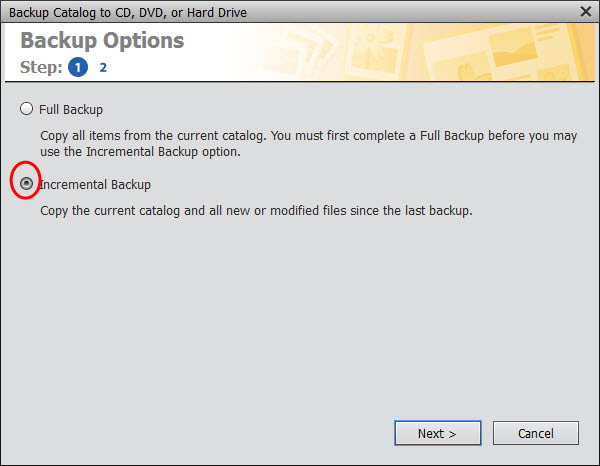 Eventually a dialog box appears where you click on the Save Backup button. A message appears stating that PSE is identifying incremental files and soon after, a progress bar appears. In this example, it took one and a half hours or so for the Successfully Completed the Backup message to appear. In this example the backup was about 17 Gb and took about two hours and forty minutes. I basically did not use the computer during this period. Also of note, is that I was backing up to a portable USB 3.0 external drive, but it was plugged into a USB 2.0 port on my PC. Also, I was using PSE 13. So, using the Incremental Backup saves tons of disk space but still takes a significant amount of time. It would be nice if Adobe would add some type of status or progress report during the time period when no real helpful information is being displayed. I generally do two or three incremental backups before doing a full backup. To find out more about my use of the Backup/Restore commands, you can check out the link below or use the Search bar on this page to view a list of all of the posts on this and related subjects.